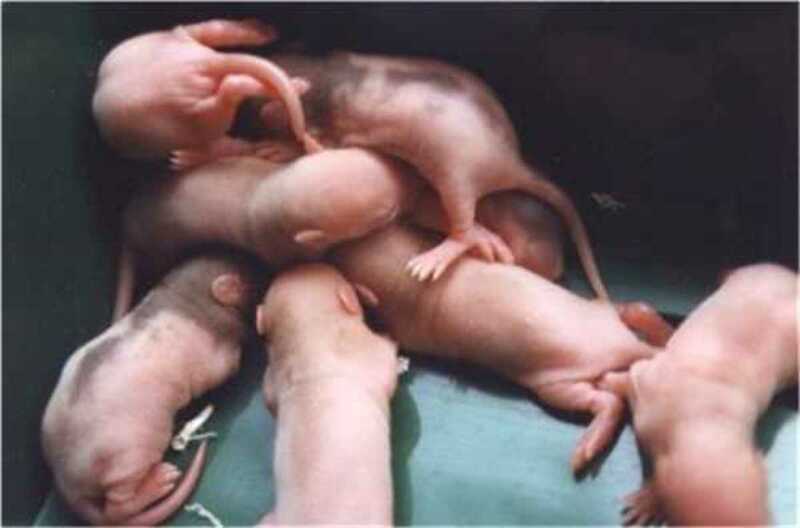 If you have decided to breed your rats or have a pregnant female, you have to expect 8-15 babies, sometimes even more. 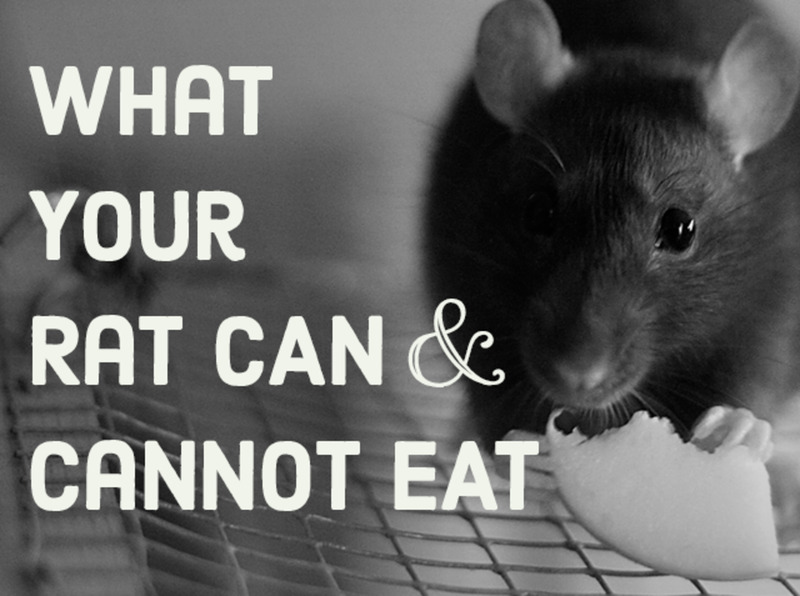 However, first of all: Don't underestimate your pet rats. She has probably prepared a nest in her house, piling up everything she gets her teeth on into a wall with only one entrance. Offer her some unscented undyed toilet paper or something similar. Your pregnant rat will accept this and layer the nest with this. It is important that the mother-to-be has her own shelter. Rats who cannot build a proper nest might eat their children! If you have the buck still with your pregnant rat, remove him. Rats go into heat as soon as they have given birth. Neuters have to be removed as well, as they. Females can stay. In the worst case, they don't care, in the best case they help looking after the babies. It can even happen that, if two females have babies at the same time, they will put their little ones into one single nest. However, consider you have to care for the babies. The babies have to be separeted 4-4.5 weeks after their birth. The does may stay with their mother, but you need a second cage for the males. If the wires are too far apart the small rats can escape - and they'll do. It's no fun to catch a fled rat if it hides behind cupdoards. Rats 7 days old. Their eyes are still closed. 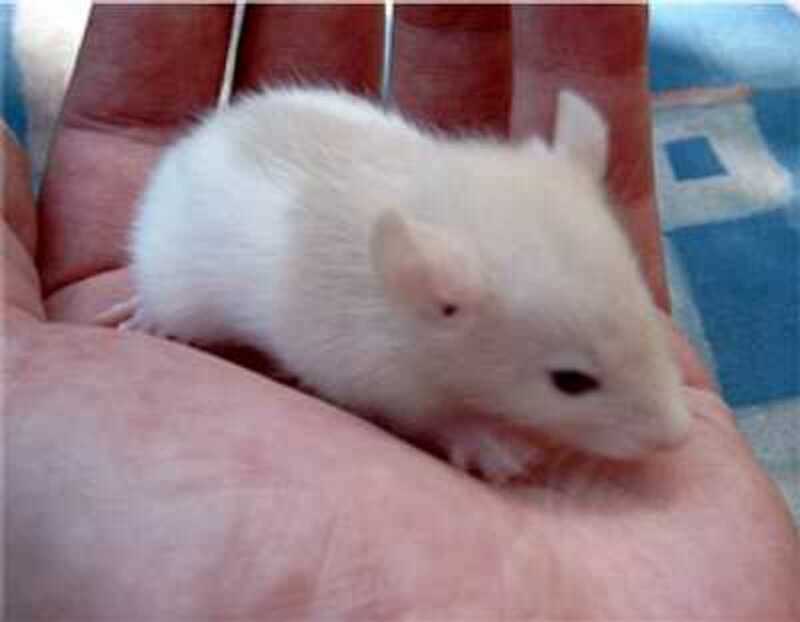 A rat 15-22 days old. The eyes have opened and their fur has grown. Rats 6 weeks old with their mother. By now you can give them to caring people. Males and females are already seperated. A baby rat with a milk belly. Rats go into labor late in the evening or during the night. 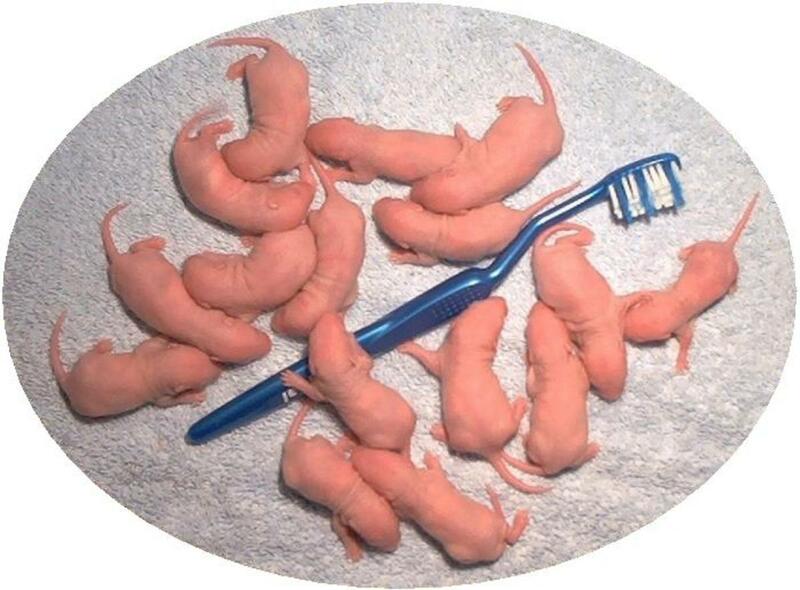 It lasts about an hour and after that you have 8-15 baby rats. I recommend you stay up, watching your rat, if you can determine when she's giving birth. Usually there is nothing to worry about, but complications can kill your rat and her offspring so it can be important to go see a vet. 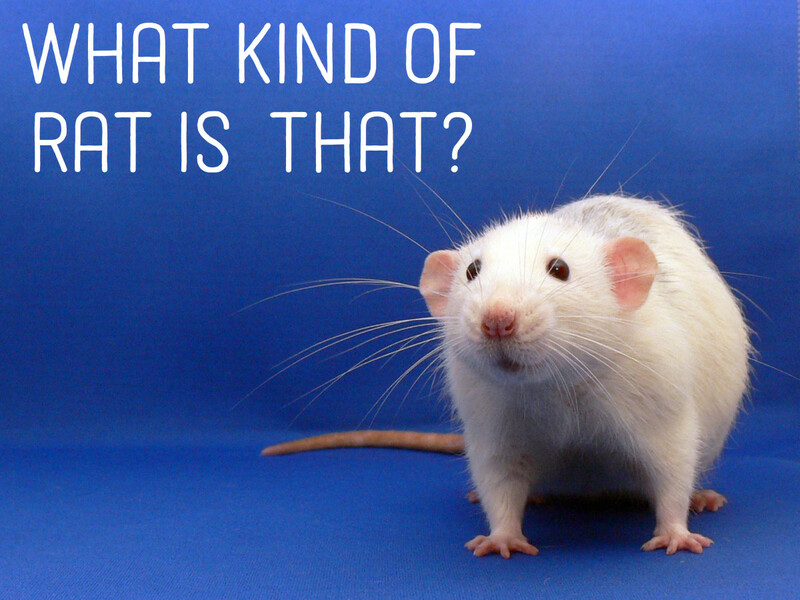 If you think something is wrong, don't hesitate and take your pet rat to an emergency vet. The babies and the mother bond and the mother takes in the smell of her little ones. The mother eats the amnion as well as the afterbirth and everything that might remain is some blood in the nest. The babies are tiny, bald and with eyes closed. They scream for their mother and that might be the first thing you notice if your rat gave birth while you are asleep. You should immeadiately check on the babies but do not touch them yet! The mother stays in the nest most of the time, feeding her children. Only when hungry she will come out to get some food. A special diet is recommended during that time: Cheese and yoghurt make good additions to her ordinary food. During the first five days it is not good to pick up the little ones. The mother might abandon them. However, you still have to check every day if the babies are healthy. You do that with a stick, while you keep their mother busy outside. Check if there are dead babies. Usually a mother eats deceased and ill babies, but you might find one. Also check if the little ones have milk bellies. Through the thin skin there should be some white visible in their belly. It is a sign that a baby is well fed. Some mothers can be aggressive, even to you! Even the tames pet rat might turn into a roaring lion and their teeth dig deep. On day five, you can begin picking up every baby and start whispering to them so they get used to humans. Beware of the mother if she's aggressive and don't take them out for too long. They are still naked and cool out quickly, though their color can be seen and fuzzy hair has already deeveloped. On about day eight you may find a baby outside his nest. The offspring is, though still blind, investigating the new world. Now the mother is busy picking up her babies and bringing them back. If you have a mother who trusts you, you can even give her the babies after you cared for them and she'll bring them back safely. After about a fortnight the ears are opened and they begin opening their eyes. 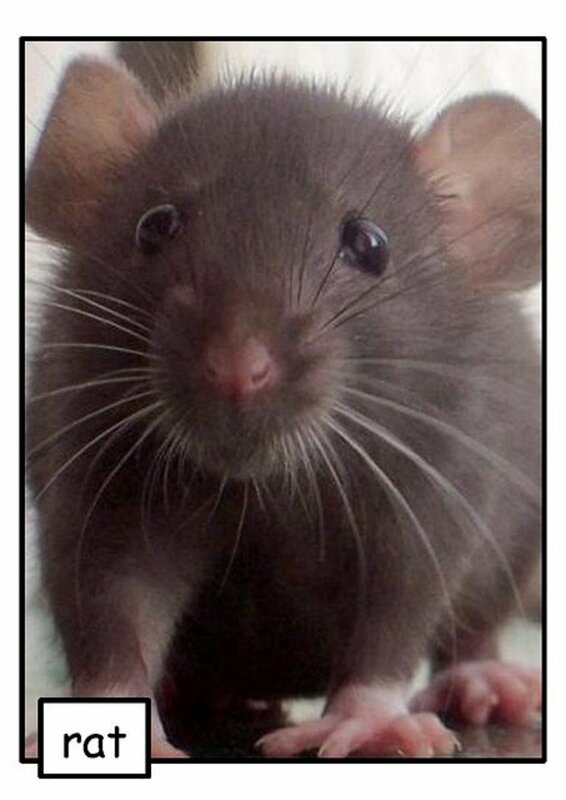 They resemble mice or tiny rats by now as they have developed fur. Now they start trying their limits, however, the mother is still trying to keep them inside the nest. 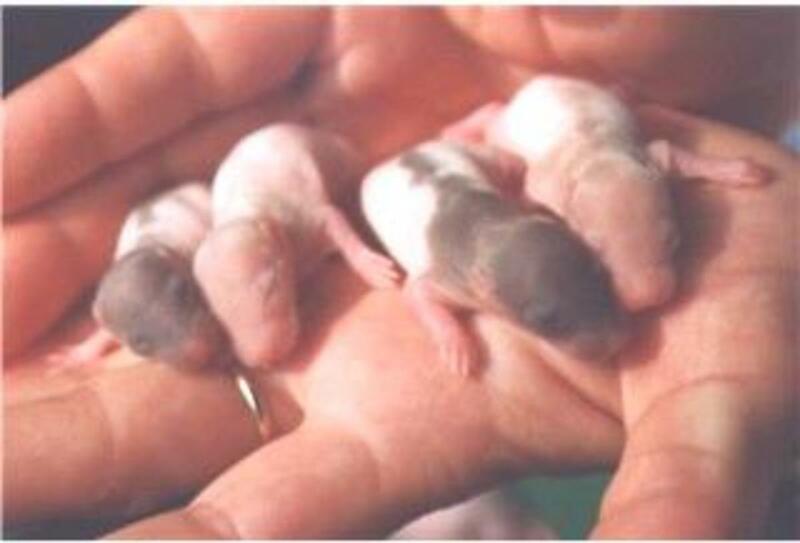 On day 22 they are fully developed and start eating solid food, though they are still being fed by their mother for about a week. After 4 to 4.5 weeks, the males should be separated since they could impregnate their mother. 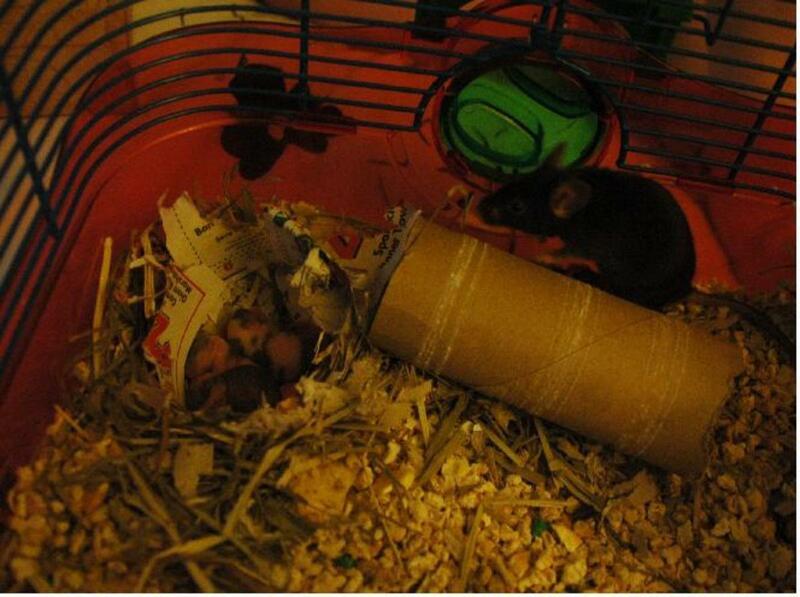 They should still remain within sight as those weeks are important for ratty behaviour development. Only after six weeks you should consider giving them to caring people. If you decide upon keeping them all, be sure you have two cages big enough and if you plan upon putting the males with their father intergrate properly (which requires an additional cage) as the father will not recognise his offspring and fight for his territory. Treat it as if you had bought a new male rat. It is a great time watching little rats grow up and even without knowledge the mother knows what to do, so don't panic. Only if something seems off to you, go see a vet. I do not breed only pets but I also breed feeder rats as well all of my breeders trust me and will actually squeak and squeal after giving birth and will run to and from her nest until I pick the babies up and make sure everyone is ok, if I do not she will go crazy until I do and never has she ever abandoned them or killed them. I have two females in each cage while pregnant and they will also normally join their nests goin into week 2 or 3 as well. Had accidental litter too on november 9 2018! Luckily i was well informed though. But once i saw this i had a better idea of what to do than before!!! The mom rat just keeps staring at me and my mom as if we are going to take her babies, what do I do? Found 3 baby rats in the brush we were clearing mom was around going frantic moved them without touching them but she's gone.. I you find wild baby rats it is not that hard to raise them as a few years ago i found three baby wild rats outside on the lawn, I didn't know what to do so i just fed then milk every few hours and kept them warm. Their eyes were still closed when i found them but all three of them survived and grew up beautifully. I found a baby rat in my room and I don't know what to do with it .it's tiny hasn't even open the eyes any suggestions? 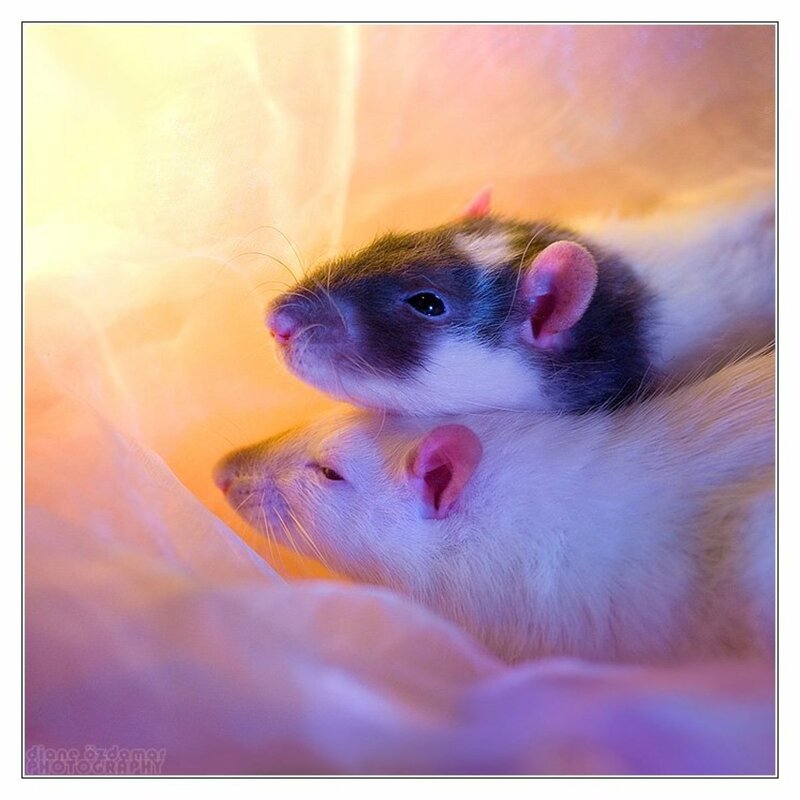 I am going to breed my rats soon... Any advice on making sure everything go smoothly? I have 2 tiny babies that were found in the street. I *think* they are rats but I am not sure. I can't post pictures here I guess, but is there someone who could positively ID them? I've had them 4 days. I'm guessing they are 5 days old, maybe 6. Mist I take the male out of the cage when the female gave birth? I just found a wild baby rat I don't know what to do I fed it warm milk and is wrapped up in a warm sock sleeping it's eyes are still closed but is wondering around. Am I doing it right??? Great article! However tissue or toilet paper is not a good bedding material until later as it can stick to the wet babies and suffocate them. Also mother rats will not kill the babies if you touch them. Thanks for the article! This is my third rat since I was four, we rescued her from the pet store as snake food the lady said that she used to be a pet but the owner could no longer care for her, she has had babies before but she did not look pregnant at the time, doing chores I had walked into my room seeing her surprised as she was licking her babies still have no idea how many she's had I'm too nervous to even get close enough to look, but so far this article has been very useful, I cannot wait to see them at 17 weeks old I will text you back at the sight of them. Just remember that if you need any help come to pethelpfull.com. Hey, Emma, I tried to email this to you, but it wouldn't let me send it. Hopefully you'll check on here again. First off, congrats! Second off, there's a very high chance that not all of them will make it concidering such a huge litter, but I would suggest switching the babies out, half and half every 3-4 hours.The babies not with the mother will be fine as long as they have a source of heat, but nothing too hot. This should give the mother some relief as well because she's not stressing about trying to feed all 25, or however many you currently have. However, if the mother seems aggressive when you try to remove some of the babies, I'd just leave her be. Although, this will make the chance of not all of them making it higher. Hopefully this helped! My girlie just had her first litter too, and I was expecting maybe 10, but she had 17! I know it's not as many as 25, but I was quite shocked to say the least. Good luck with your litter! 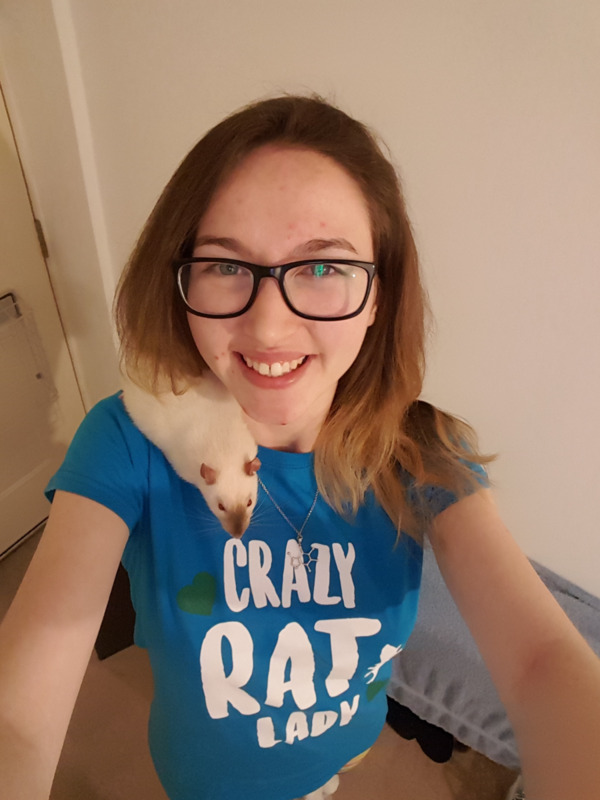 i like the artical and my cousin thinks that her brothers rat jade is pregnet shes breathing really hard and walking like a four legged penguin. she is old enough and big enough to be pregnet. and she is scard. 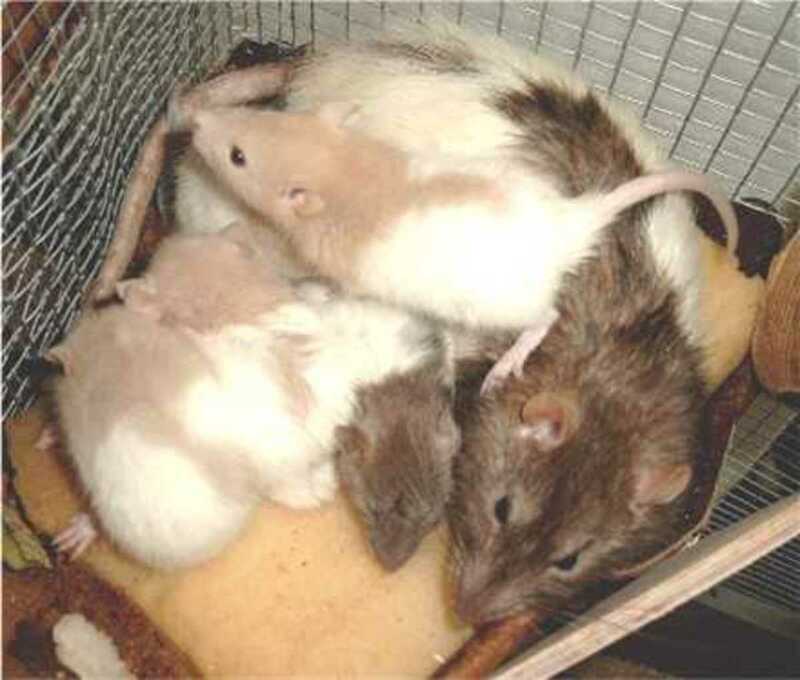 Does anyone know when it is okay to put the male rat back with the female and babies? My pup has a black spot on its head not like a design, just a black spot is it a disease? I found a wild baby rat who was abandoned I have it wrapped on a blanket and I feed it regular milk I've never raised rats IDK if he will make it but can u help me out?? My rat had 12 babies lastnight and 5 died leaving her with 7. She bit me once and now I'm scared to touch her, how am I supposed to clean her cage, when can I touch the babies, I'm 15 and appreciate all the info I can get. could someone give me tips about female rats cause this is my first pet. IF anyone is from South Grafton cause i need to know if anyone that goes to coles in South Grafton should i feed my female rat nibler. If you go down the pet ile at the very end you will see bird seeds but near the top there nibler is. Help I got these two baby rats the lady told me they was 6 week there is not way they are sooo tiny and look to be about a month maybe they are eatting some sunflower seeds but I haven't seen them drink at all today!! Do u think it's just bc they are in a new home and scared!! Should they start coming around!! She said they was males but u can't see anything on either of them yet!! I'm beginning to think they where way to young to even take from momma yet!! There so cute and I want them to be ok!! 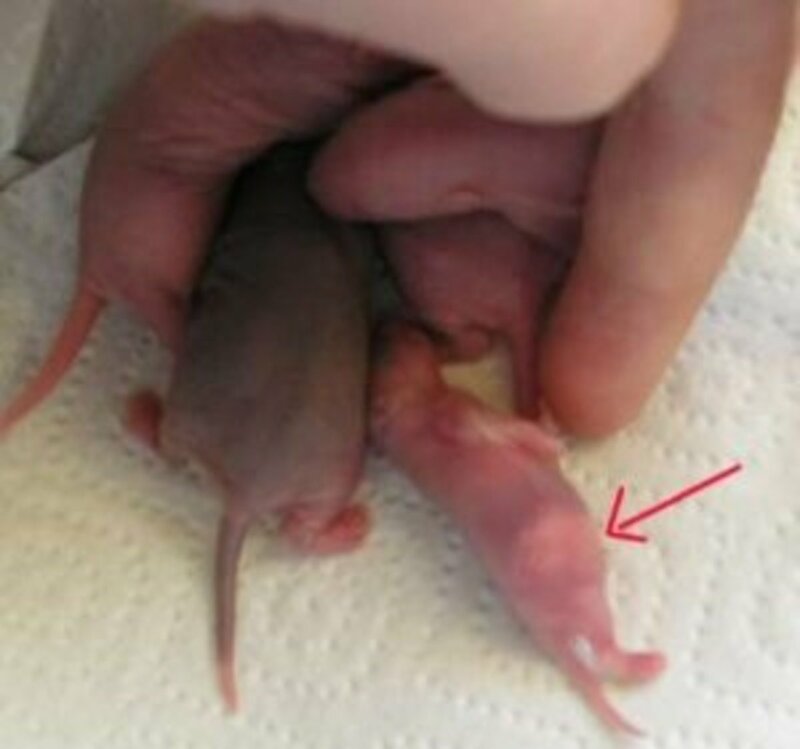 My rat just had 1 baby last night is it normal to have one baby only? So, the guy at the pet store told me my rat was a male ( I asked because I would be housing it with another male). Imagine my surprise when I woke up this morning to ten bald babies! 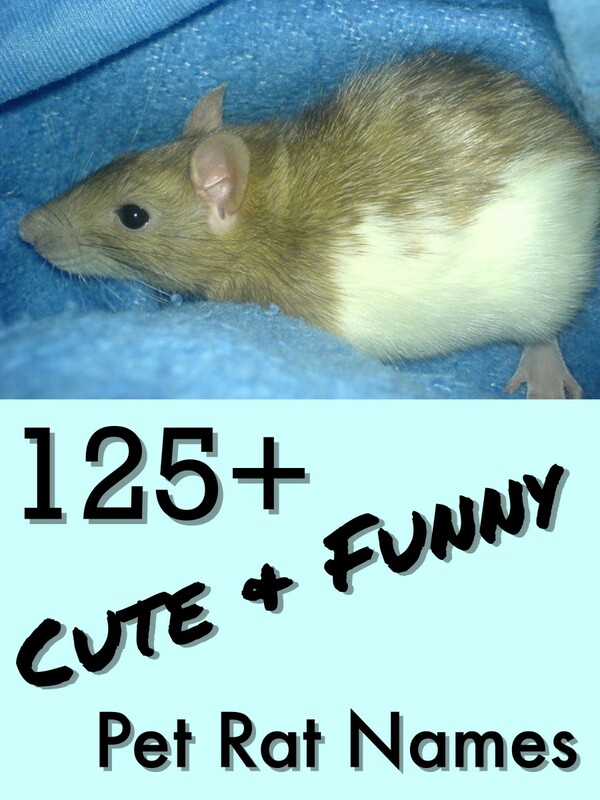 This site helped so much I bought a 5 month old or so rat and she is very pregnant. I started worring about the situation but you really helped me. Thank you!